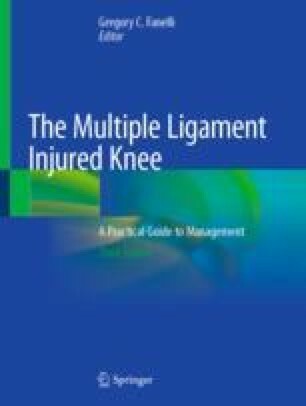 Multiple-ligament-injured knees pose a challenge to the orthopedic surgeon and the patient. Complications are common, as neurovascular structures may be injured and can even result in limb-threatening situations. Other injuries to the ipsilateral extremity further complicate the diagnosis and treatment. The clinical outcomes studied previously have often been discouraging—patients can have chronic pain, stiffness, residual instability, and early post-traumatic arthritis in the aftermath of the injury. Injuries to the posterior cruciate ligament (PCL) and both the posteromedial corner (PMC) and posterolateral corner (PLC) should be managed surgically with anatomic reconstruction of the stabilizing structures. An anatomic double-bundle suspensory technique that uses the Achilles tendon allograft is a reliable and reproducible method for PCL reconstruction. If there is a concern for intersecting tunnels due to tunnel crowding or previous tibial plateau fixation, the PCL inlay technique may be used. The PMC is reconstructed with allograft by reconstruction of the MCL and posterior oblique ligament. The PLC can be reconstructed with a modified two-tail technique, which reconstructs all three critical components of the PLC—the fibular collateral ligament (FCL), popliteus, and popliteofibular ligament. Alternatively, the PLC can be reconstructed with a figure-of-eight technique if there is no rotational instability on examination.